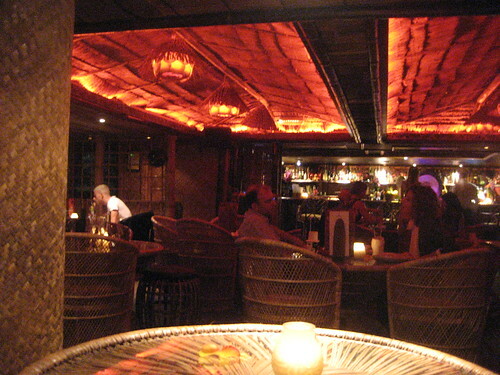 Nightlife entrepreneurs Nick House and Piers Adam opened Mahiki in 2006 and it quickly became a hotspot thanks to frequent appearances by celebrities and Princes William and Harry (their friend Guy Pelly handled promotions). The brand has since expanded with launches of signature rum, limited-edition swimwear, and pop-up events, plus a second Mahiki location to open in Dubai, and a huge space to be converted into Mahiki East for the London Olympics. 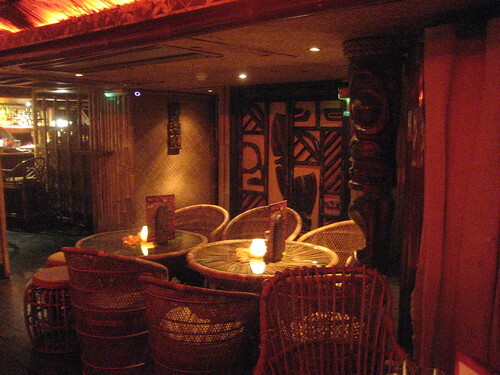 Once inside, you head down a staircase—fitting as Mahiki is named for the path to the underworld in Polynesian mythology. 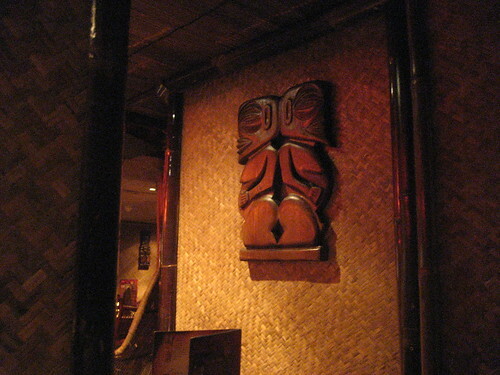 The owners wisely brought in CheekyTiki to do the decor and they went all out. 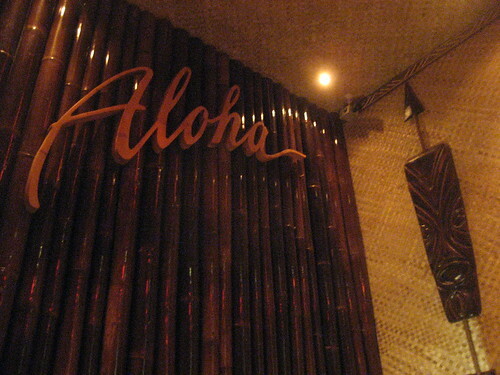 The lounge is filled with tons of bamboo, lauhala matting, shell lamps, rattan chairs and tikis. I especially loved this Hawaiian Chief seat of honor. Another level below that is the nightclub, which seems to downplay the theme a bit in comparison, though there is a glassed-in tiki garden in amongst the big round booths and dance floor. 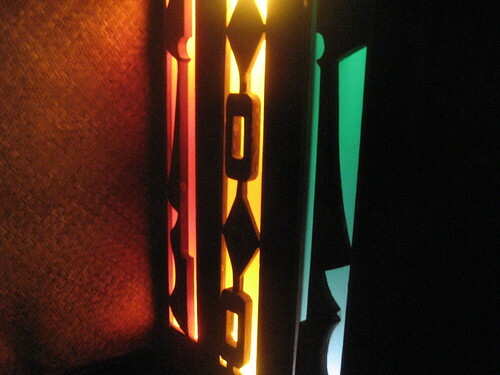 Somewhere about is the “No-Tell Motel,” a retro-trashy styled private party space which from their photos has karaoke in a shower, disco balls galore, a bed and a stripper pole. 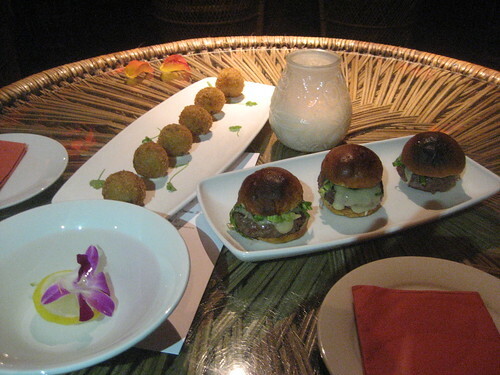 The modelesque hostesses wear tropical printed dresses and headsets, flitting about like secret agents out of “Hawaii 5-O.” At our service was a jolly fellow in full sailor suit, complete with a cap and faux American accent, who rolled around one of those Old World-style globe bars. Quite a juxtaposition between the serious and silly attitudes. The beautifully designed cocktail menu offers about three dozen selections, including some classics like the Zombie, but mostly original creations by Soul Shakers. Mr. Hockey was a fan of the tart and bubbly Mahiki (£8), comprising Bacardi Gold, Sailor Jerry, pear and strawberry purée, lemon, crème de fraise and Champagne. 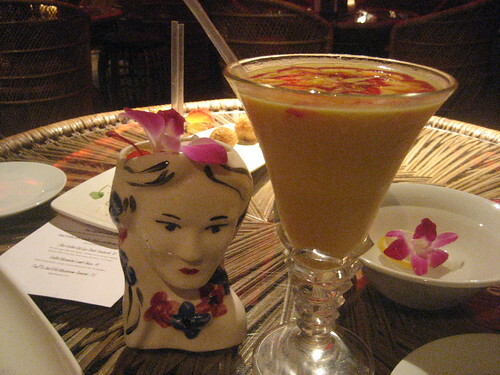 Meanwhile, my favorite of the night was the off-menu Paradise Club made with Mahiki Coconut, coconut creme, lime and guava juice. 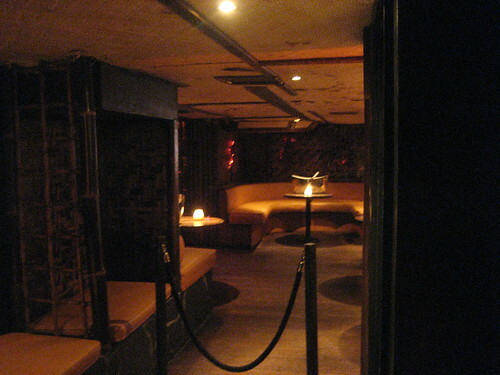 Mahiki definitely does some things right, like the decor and the drinks, but they seem to give a cold shoulder to anyone that’s not a socialite or bigspender. There are numerous reviews online about people being rejected at the door for flimsy reasons (or being told there’s no guest list when there actually is), so proceed with caution. 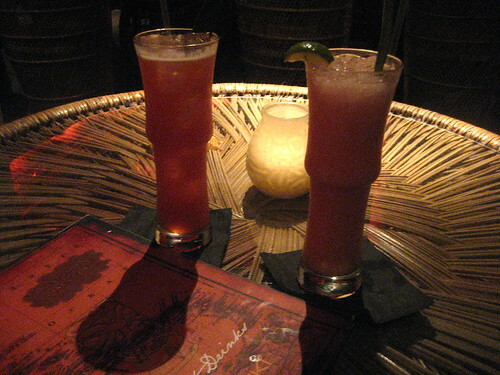 And if they give you any trouble, Trader Vic’s London is less than a kilometer away. Great review. It’s too bad the place has such an attitude. 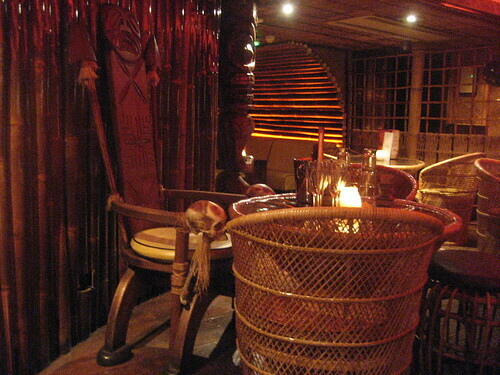 I can’t wait to go on a London Tiki Tour sometime. Thanks! There are so many places, we barely scratched the surface. Mmmm, deep fried risotto. This place looks great! 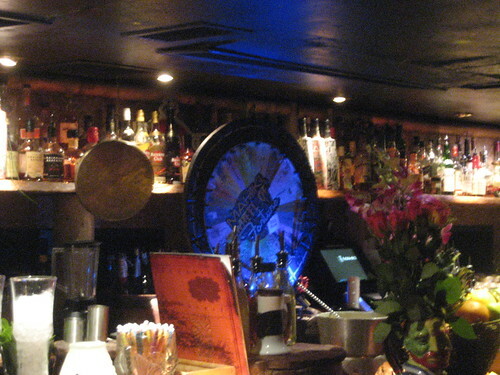 My fav tiki bar in London is hands down Trailer Happiness! 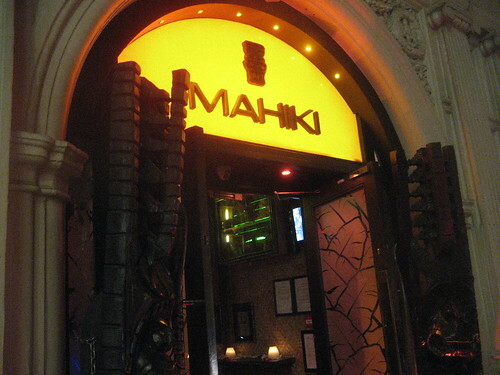 I really wanted to make it there on our London trip, but the shenanigans with Mahiki’s door policy screwed up our plans.